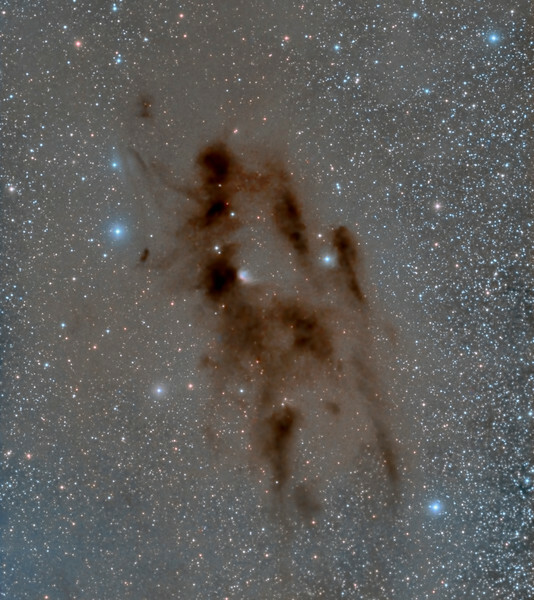 Barnard 22 a dark nebula with IC2087 relecting in the center. I am naming this "The Cosmic Ballerina" as with subtle processing and a little imagination you can even see her face. Let her weave a dusty dance in Taurus. Taken by Lynn Hilborn, Whistlestop Obs,Grafton,Ontario on November 5 and 7, 2016. Teleskop Service 71 @f5 and Moravian G2-8300 camera. One hour each RGB and 3 hours of Luminance.